Quinoa has become a popular food globally thanks to its healthy image. The boom has benefited farmers in Peru, but these gains are now under threat from growing international competition. Rodrigo Cisneros looks out at his fields of bright-yellow quinoa plants extending far over the rolling slopes of the Andes. Just five years ago, Mr Cisneros had a small plot of land, growing food mainly for his own family's consumption. He occasionally sold small loads of potatoes in the nearest town. Today, thanks to the global popularity of quinoa as a "super-food", Mr Cisneros, together with his two brothers, owns more than 20 hectares of land and employs 15 farm workers. 'My ancestors, my grandparents and parents, have always grown quinoa. I grew up eating quinoa but we didn't sell it," he says. Earnings from quinoa have paid for his daughter to study at university in Lima. He has also bought a solar panel and has electricity for the first time. In the evenings, he watches football on television or uses the light to read books on self-improvement. Quinoa is high in protein, low in carbohydrates and gluten free. "Is it a superfood? People wouldn't pay good money for it if it wasn't, they're not fools," says Mr Cisneros. "Fried potatoes and chicken can sometimes give you a stomach ache, but quinoa never does, it's easy to digest." The price of quinoa in Peru rose more than 500% between 2005 and 2014, while production grew from 32,590 to 114,725 tonnes in the same period, according to Peru's ministry of agriculture. The quinoa boom has also transformed the fortunes of Fredy Bautista and Yudy Cisneros, whose farm has grown from one hectare to 12 hectares since 2012. "We can educate our children now and we have bought a little house," says Ms Cisneros. But the couple still do not have electricity, using candles and kerosene instead. "We go to bed early and get up when its light, that's what people in the countryside have always done," says Mr Bautista. They too have always eaten quinoa. "Our children eat quinoa for breakfast, with milk, sugar and cloves. For lunch, I put it in soup with vegetables and a little bit of meat, coriander and parsley," says Ms Cisneros. These farmers are all members of Ayacucho's Quinoa producers' association (APOQUA). Mr Bautista says that grouping together in an association has made it easier to take advantage of the rising prices. Jonathan Contreras is the association's commercial manager. He says it is hard for individual small farmers to negotiate a price with traders and intermediaries. "They don't have the bargaining power. By clubbing together, we have been able to export to international markets." The majority of quinoa farmers in Peru still live on small plots of land. 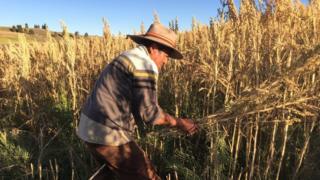 Some 72% of quinoa growers own less than five hectares and these small farms account for 38% of the quinoa grown in Peru, according to ministry of agriculture figures from 2012. John Bliek of the International Labour Organisation (ILO) says most of these small farmers remain poor and have not been able to take full advantage of the quinoa boom. In these highland areas farmers are often illiterate, the state is barely present and there is a lot of migration to the cities. But he says that farmers who have formed co-operatives have seen improvements in their livelihoods. "Together they can start producing on a bigger scale, increase productivity, access overseas markets and get the best price for their crops," he adds. Peruvian farmers now face another problem. The price of quinoa has fallen by 75% since 2014, as other countries such as the United States, Canada and Argentina have started producing it. Image caption The quinoa genome has been mapped and that could mean competition for Peruvian famers. Peru is the world's largest producer of quinoa accounting for just over half of the global supply. Neighbouring Bolivia is the second-largest producer, accounting for just over a third. The plant thrives in the high altitudes of the Andes mountains. But in 2017, the genome of quinoa was mapped and experiments with different varieties of the plant that can grow in different climates and habitats are under way in Africa, Asia and Europe. This could lead to further price drops. But Mr Bliek says Peruvian growers still have advantages because quinoa "is a Peruvian product that has strong cultural roots". "There is a story that 3,000 to 5,000 years ago, the stars gave quinoa to the Aymara indigenous people as a gift. These cultural roots give farmers here enormous benefit over people who try to copy them," he argues. "And although there is a threat that prices could fall, rising production in other countries could also increase the awareness of quinoa worldwide, which could create new markets for Peruvian farmers."